PhD Nutrition Intra BCAA+ is a unique and fantastic Branched Chain Amino Acid (BCAA) formulated with Coconut water and Vitamin C to help hydrate the body, reduce fatigue whilst maintaining a healthy immune system. PhD Nutrition Intra BCAA+ provides over 7000mg of essential amino acids per 15g serving as well as 2400mg of L-Glutamine in the ratio of 4:1:1, making it the perfect drink for during exercise or anytime when you need to boost your protein. 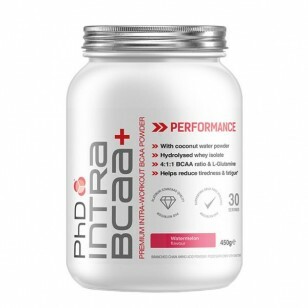 PhD BCAA+ is also perfect for fasted morning exercise/Cardio. When the body does not have any carbs in the system, muscles are used for energy when exercising which puts the body into catabolic state , BCAA+ will help increase protein synthesis which will put the body in anabolic state. 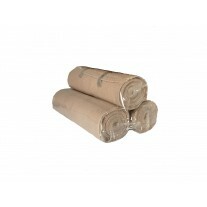 Available in Watermelon, Coconut & Lime and Coconut & Mango flavours. Intra BCAA+ is best used during intense exercise of any kind, but can also be used throughout the day to increase protein and branched chain amino acid intake. Do not exceed 3 servings daily.